From a different parking space, obviously. It isn't easy to keep lines straight when leaning on the steering wheel is it? There is an exhibition coming up in mid July by one of my all time favourite living artists - David Prentice. 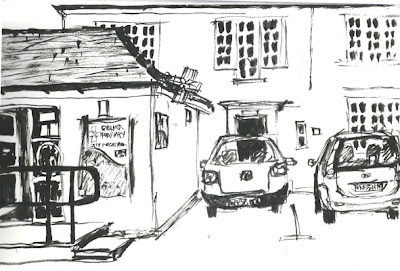 It's at a great spacious gallery in Moreton in Marsh, the John Davies Gallery. As yet the images aren't on the website, but they will be nearer to the time. It's a retrospective of his work in celebration of his 75th birthday, with work going back many years. A great chance to see the development of ideas and the strong individual ideas that weave through his work. I highly recommend buying the catalogue and reading the interview. 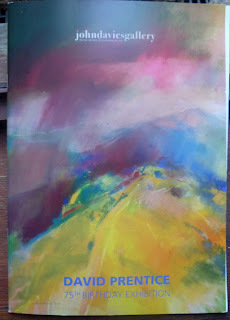 DP walks daily in the Malvern Hills, sketching and observing. 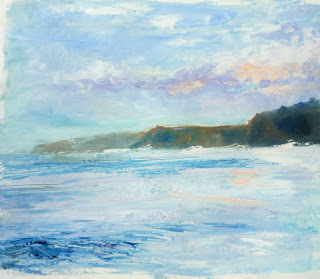 Then he works in the studio, huge canvasses, pastels, watercolours, intimate smaller pieces - all with this keen observation and wonderful handling of colour and light and a sense of place, time, passing weather systems, movement. Get there if you can. The paintings are so much more in real life than a tiny image onscreen can show. I wasn't happy with this and have worked on it a little more. You can see the previous stage here. I wanted to keep the sky as it sets the mood and adds scale and distance - but for me the composition wasn't really working as it was. One change was to darken the sky - it needed to be darker to balance the tone of the lower part of the painting. I gave the horizon a slightly lost edge against the clouds on the right to get away from that hard horizon line. I also wanted that sense of light coming through a gap in the clouds to light up the cliff tops and sea, with passing shadows so it was important to see the clouds. I do love that sort of light. 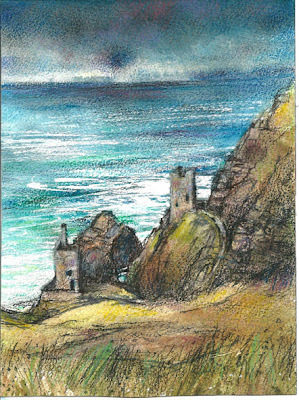 I lost the hard forward edges of the buildings where the ink lines were too heavy - watercolour mixed with white gouache helped me to lose them and allow edges to be softer and closer tonally to the sea in places. 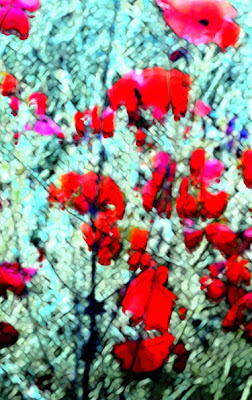 I was really disappointed with the photos I'd taken of the poppy field, they were bad - it was so dramatic and that didn't fully come out in the pictures. The result still isn't great! I needed a better photo to start with - maybe I'll get out to take some more with the 'best' camera instead of the compact. My well used, watercolour box - the hinge is broken on one side and the lid is held on by gaffer tape and it needs a bit of a clean up! When I did the post on my oil painting plein air kit, I said I'd do a follow up on what I take if I'm going to work plein air with watercolour and mixed media. You really don't need to buy special kits and they will never be quite 'right' for what you want to take. I hesitate to show this grubby specimen! but this is the true state of it so I'll be honest! :>) I bought this at an art materials fair years and years ago. Playing with the close up filters again. I love the way that it throws the background out of focus - these were using the 10+ and the 2+ filters together - which cuts out a lot of light (meaning even shallower depth of field/danger of movement blur) and causes a really shallow depth of field. 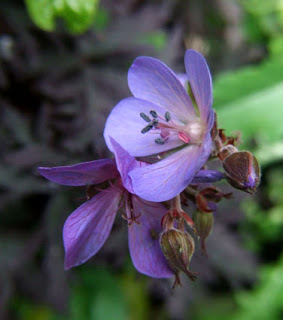 The top geranium is a new one this year and has these wonderfully intense deep purplish/black leaves. It took me years to think to grow Hydrangeas but I've now got 2 - one in a pot that is a beautiful intense purple/blue (various shades of it over the plant, some bluer, some purpler, I feed this with the aluminium salts to keep it blue as it started to turn pink in it's second year) and the other the delicate pale blue and cream one in shade at the foot of the garden. The pale one was new last year so I wasn't sure if it would revert to pink - but so far so good. I like the delicate colours. I've been given a set of Inktense blocks and wanted to have a play, see how they behave and what they can do. I've got about 6 of the Inktense pencils and like them, so I was interested to see how the blocks behaved. 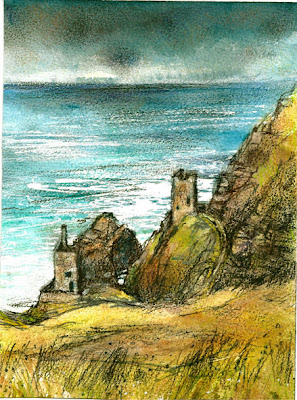 I worked loosely from the charcoal sketch I did plein air and the ink sketch - using memory for the colours. 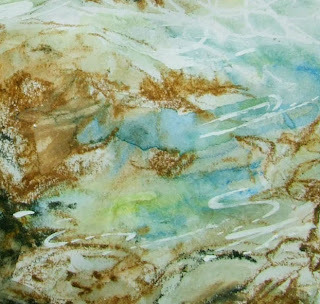 I do like the way the Inktense colours layer and their translucency - in this one I used the blocks mainly as you would watercolour pans with very little drawing with them. I think to draw with them (then use water to wash) I'd need to work A3 to have room for big gestural marks. Something I may try next. 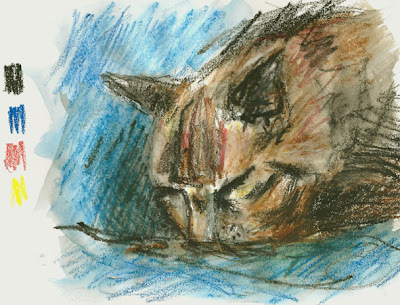 I used ink and coloured pencil (Polychromos and Lyra Rembrandt mostly) over the washes and scribbles of Inktense and the rough paper surfacew meant these flicker across, touching the high parts of the paper, missing the dips. Another one from the recent trip to Cornwall. This one is on A3 paper. Done very quickly to react to the changing colours and light. This painting was done with just the colours above - blue, red, yellow, black, brown plus white. 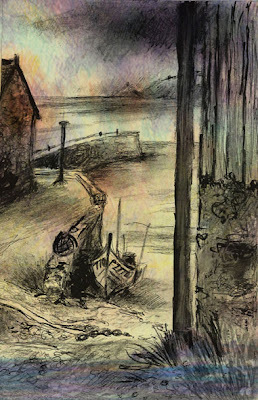 I did a charcoal sketch of this view down to the harbour at Sennen and then played with adding colour in Photoshop to make it moodier. Working with a limited palette - I forgot to put a scribble of the brown down on the left - but done with just 5 colours. This was my contribution to the postcard exchange this month. It's a view across the bay from the house we stayed at. Skies there are always lovely with the sun rising over to the right behind the land, glowing - and setting over behind the headland to the left of the crescent shaped bay. 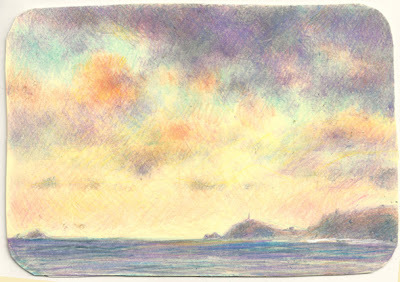 The weather frequently comes in from across the Atlantic and as the moist air hits the land, the clouds form over Cape Cornwall - that headland attached to the mainland. Off to the left are the Brisons, huge jagged rocks that feature in some of the other paintings I've done in the area. This one was all about that sky.